WINONA, MINN., USA – PlastiComp, Inc., a global leader in long fiber thermoplastic (LFT) materials and technologies, announced that its quality management system, which guides the design and manufacture of its composite pellet products and LFT technology solutions the firm delivers using those materials, has received certification to the newest ISO 9001:2015 standard for quality systems. 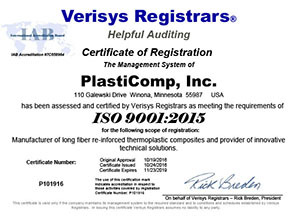 Established in 2003 and headquartered in Winona, Minn., PlastiComp compounds long fiber reinforced thermoplastic composites using a pultrusion process to melt impregnate continuous carbon, glass, or specialty fibers with a wide range of thermoplastic polymers. Incorporating reinforcing fibers into plastics creates composites with structural performance capable of replacing metals. 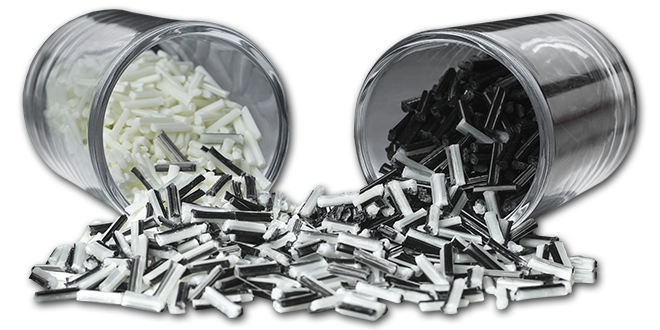 Noted for being stronger, tougher, and lighter, Complēt® long fiber composite pellets from PlastiComp are formed into components or finished goods using injection molding or extrusion processing methods. They are available globally to produce applications for aerospace, defense, healthcare, industrial equipment, sporting goods, and transportation market segments that require high performance materials.